See 50 years of campus history presented in this five-minute video. 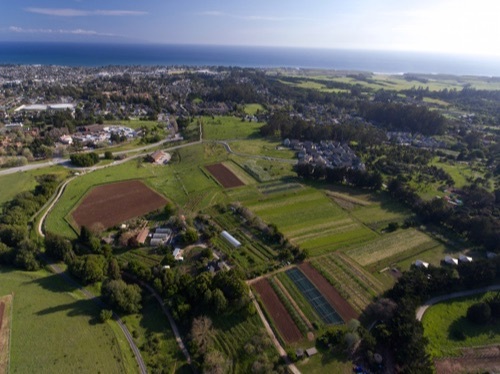 This aerial view of the UC Santa Cruz Farm shows the stunning location of the oldest university-based organic research and education facility in the country. Photo by Jim Clark. "Food affects everybody," says apprentice David Robles (BA history, 2016). "Everybody's got to eat, so food is a great way to put environmentalism at the front of people's minds." Photo by Carolyn Lagattuta. 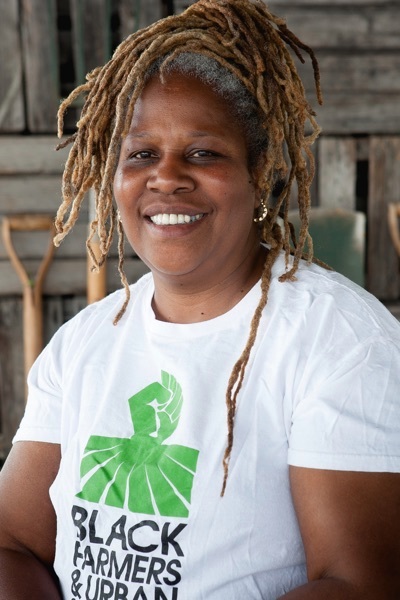 "To grow your own food gives you power and dignity," says 2008 apprenticeship graduate Karen Washington, who lives in the Bronx and co-founded Black Urban Growers to diversity the burgeoning food movement. "When I was in Santa Cruz... I asked, 'Where are the farmers who look like me? Where are the black farmers? Where are the people of color in the food movement?'" Middle age has a way of sneaking up on people and programs, so hearing now that the experiment in organic gardening that began at UC Santa Cruz in 1967 is the oldest university-based organic research and education facility in the country is, well, unexpected. "It's the people's farm," says Daniel Press, professor of environmental studies and executive director of the internationally acclaimed, hands-on learning and research programs housed at UC Santa Cruz. "What began as a student- and faculty-initiated idea to create a garden as a place for repose, renewal, and connection is, today, an incredibly well-rounded resource that exists to serve and inspire people." More than 1,500 apprentices have learned the art and practice of organic farming and gardening at UC Santa Cruz, making them the "signature crop." "If you meet an organic farmer in California, we probably trained them or someone who trained them," says Press, only half in jest. Farmers aren't the only crop produced by the Center for Agroecology and Sustainable Food Systems. The Center is home to a range of programs that have upended just about every aspect of food production. "Universities are incubators of new ideas, and the Center has brought together the science and social aspects of food production in a way that is changing the landscape and the body politic," says Press, who would like to retire the Center's unwieldy name in favor of something more lyrical. Recently retired Congressman Sam Farr (D-Carmel) was an early and passionate fan of the campus's agroecology programs, and his advocacy in Washington, D.C., brought in much-needed federal support during his 22 years in the capital. "The modern-day food movement really began at UC Santa Cruz, where a small band of visionaries embraced organic agriculture and did things that conventional growers said couldn't be done," says Farr. "Those pioneers went back to basics, learning how to nourish the land and grow crops without harmful chemical inputs." Those visionaries started a revolution that is stronger than ever 50 years later, adds Farr: "They're still the visionaries, pushing for safe working conditions and fair wages for farm workers, training farmers, promoting community-supported agriculture, and always as guardians of the public interest and our precious natural resources." It all began 50 years ago when faculty and students appealed to Chancellor Dean McHenry, proposing a garden project that would serve as a central gathering spot on the remote, forested campus. As legend has it, Alan Chadwick, a charismatic, somewhat cantankerous master gardener from England, chose a steep, rocky, sun-scorched slope covered with poison oak to prove a point: If students could create a garden there, they could create one anywhere. And create they did. With no chemical fertilizers, pesticides, or herbicides, Chadwick and his crew used only natural fertility, hand tools, and love to create a lush 4-acre plot that soon overflowed with vibrant vegetables and fragrant flowers. Chadwick introduced the French intensive, raised-bed method of gardening that features double digging, compost-enriched soil, dense plantings, and diverse crops. Today, the garden's beds produce tender, melt-in-your-mouth lettuces, succulent basils, a rainbow of peppers, a cacophony of blossoms—all framed by redwoods, citrus trees, and more than 120 varieties of heirloom apples and pears. Just up the road from Chadwick's merry troupe, Alice Waters, the owner of Berkeley's famed Chez Panisse restaurant, was planting the seeds of a flavor revolution by creating an appetite—and demand—for fresh, organic, locally grown fruits and vegetables. "Chez Panisse and the Center are kindred spirits, changing the world by changing the way we eat, the way we grow food, and the way we teach our children about the land," says Waters. On campus, the garden became a "laboratory"—a hub of teaching and hands-on learning that became a model for all that followed. "UC Santa Cruz has been at the forefront of the food movement for decades, preparing farmers, teachers, cooks, community activists, and policymakers to help us build a healthy, sustainable food system," says Waters, whose own mission has also broadened; she founded The Edible Schoolyard in 1995 to bring a hands-on, garden-based "edible education curriculum" to children from kindergarten through high school. The campus rapidly outgrew the garden as students, faculty, and researchers joined the burgeoning "alternative food movement." In 1971, the garden program branched out onto an additional 17-acre plot down the hill. The formal six-month, residential Apprenticeship in Ecological Horticulture was born, a certificate program offered through UC Extension, and the new acreage meant the program could expand to include tractor-based farming for the first time. "The UCSC Apprenticeship Program is the original innovator of farmer education in sustainable agriculture," says Kathleen Merrigan, former deputy secretary and chief operating officer of the U.S. Department of Agriculture and now the executive director of sustainability at George Washington University. "Its graduates are everywhere in the field of sustainable food systems." The program grew, and graduates of the apprenticeship fanned out to start their own organic farms and gardens. Word spread, and applications poured in from across the country—as well as Canada, Africa, Mexico, and South America. Meanwhile, the increased acreage also accommodated scientific research trials. Center researchers partnered with local farmers to pioneer ways to grow crops like apples, artichokes, and strawberries without hazardous fumigants, pesticides, and weed killers. Interest continued, and the Center for Agroecology and Sustainable Food Systems was established, formalizing the nation’s first university-based program in agroecology, a scientific approach that emphasizes the ecology of farming systems. Training farmers and "greening" food production wasn't enough, though. As part of its commitment to enhancing the viability of small farms, the Center nurtured the "community supported agriculture" model in which members "invest" in the farm upfront, giving growers a guaranteed income at the start of each season. Staff share their expertise by writing organic crop-production training manuals on key crops--and distributing them free online. And they worked to broaden agricultural policy to include issues of social justice and worker welfare, bringing wages, working conditions, and the tragedy of farmworkers who go hungry into the conversation. "The central coast of California is the capital of organic agriculture in large part because of UC Santa Cruz," says Press. "This university championed organic farming before anyone else, training farmers and raising public awareness about the environmental significance of growing food without synthetic chemicals. Today, the Center is broadening the definition of sustainability to encompass the well being of people as well as the environment. We need its leadership now more than ever." Although undergraduates launched the garden program, over the years a relatively small portion of students tapped the Center's educational opportunities, although some took advantage of internships, independent study programs, and field study. With Press's arrival as executive director in 2012, the Center began strengthening ties with the campus's academic programs. Today, hundreds of students partake of the smorgasbord of experiential learning opportunities, including classes with labs at the Farm and Chadwick Garden. Students can choose a concentration in agroecology and sustainable food systems offered by the Environmental Studies Department, and Press would like one day to offer a major in agroecology. UC Santa Cruz is not a land-grant campus, so it's not one of UC's "ag schools," but that hasn't kept the Farm from becoming a busy research site that channels millions of federal dollars into efforts to improve crop production, soil health, and the sustainability of food systems. "The big ag schools solve problems for the agriculture industry in their region," says Press. "Our niche is to solve the problems of organic production. Thirty percent of agriculture in Santa Cruz County is certified organic." Nationally, demand for organic food climbs steadily; in 2015, nearly 13,000 certified organic farms produced $6.2 billion in commodities, according to the U.S. Department of Agriculture. California leads the way with $2.4 billion in sales—40 percent of total U.S. certified organic sales. Among the signature achievements of the Center's research program is the development of strategies to produce strawberries without harmful soil fumigants like methyl bromide. In the early 1990s, faced with the phase-out of methyl bromide, conventional growers literally said it couldn't be done—and then Center researcher Sean Swezey and Environmental Studies Professor Steve Gliessman did it, collaborating with Jim Cochran of Swanton Berry Farm. That breakthrough led to more research by Environmental Studies Professor Carol Shennan and research scientist Joji Muramoto. Their approach focuses on anaerobic soil disinfestation, a clever strategy that uses short-term field flooding and organic matter to create a temporary environment that kills off harmful soil pathogens prior to planting. The Center's leadership is evident across the UC system, where CASFS representatives, led by food systems researcher Tim Galarneau (Rachel Carson College '05, psychology), spearheaded UC’s systemwide adoption of 20 percent "real food" purchases, driving the university's commitment to buy food that is produced in a fair, humane, and environmentally sustainable manner. UC Santa Cruz is committed to purchasing 40 percent "real food" for its dining halls and other food facilities by 2020. The Center's reach extends to K-12 partners, as well. Affiliates are working to improve K-12 school nutrition programs through partnerships with 15 school districts in Monterey, San Benito, and Santa Cruz counties. The Farm is also home to Life Lab, the oldest garden-based K-12 education program in the country; Life Lab brings more than 2,000 students to the Farm every year. And Food What?! is a Farm-based youth-empowerment program that uses farming, gardening, and cooking to build life and career skills. Fifty years after it all began on that steep hillside across from Stevenson College, the apprenticeship continues to attract applicants from across the country and around the globe. Only one in three are admitted—a higher ratio than years past as programs around the country have copied the apprenticeship model, says Press. "This model seems to appeal to people," adds Press, noting that the average age of farmers in the U. S. is 57. "Most of our apprentices don't come from farm families." The lucky 39 who are selected each year get an education like no other: Apprentices receive 700 hours of field instruction and 300 hours of classroom learning over the course of six months, covering everything from seed propagation to tractor cultivation. This year's cohort includes educators, urban farmers and gardeners, youth empowerment advocates, three graduate students, and several recent college graduates. Apprentices hail from California, Oregon, Washington, Arizona, North Carolina, and South Africa. Current apprentice David Robles is a recent graduate of UC Santa Cruz (History, 2016). As a student, he focused on social movements—and feels today that he is in the midst of an important one. "Food affects everybody," says Robles. "Everybody's got to eat, so food is a great way to put environmentalism at the front of people's minds." But the Center's mission is bigger than just the environment. 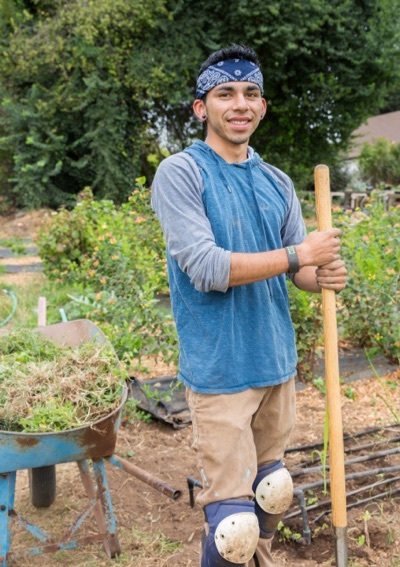 "When you pay a couple dollars more for organic, locally grown food, you get a couple dollars of justice for the people who grow, process, and distribute your food," says Robles, who plans to work with youth after the apprentice ends in October. "Youth education is the way to build a movement that revolves around sustainability and empowering people," says Robles, who enjoys the tangible rewards of working the soil—particularly in an era when threats like climate change can feel overwhelming. "It's a very hands-on approach to making the world a better place. The Center has come a long way over 50 years. It was just about organic gardening, and now it's about the global economy and the global ecosystem. It has gone from a technique to a social movement." Apprenticeship graduates carry the mantle forward as farmers, teachers, urban gardeners, community organizers, policy makers, directors of nonprofits that serve veterans and the incarcerated, and more. Karen Washington, a 2008 graduate of the apprenticeship, is a lifelong community activist and a champion of food justice. A co-founder of Black Urban Growers (BUGS) and Rise and Root Farm, located an hour north of New York City, Washington focuses on giving people equal access to soil, whether they are in the Bronx or the suburbs, rich or poor, high school dropouts or Ph.D.'s. "To grow your own food gives you power and dignity," says Washington, who lives in the Bronx. "For so long in the inner cities, there was a disconnect between where your food was coming from and who was growing it, because of the convenience of going to the supermarket." Giving urban dwellers the opportunity to grow their own food is empowering—but not all are initially receptive. "Whites embrace it, but for low-income and people of color, they hear 'Grow our own food' and say 'That's slavery!'" says Washington. "We have to understand that narrative to be able to reshape it. Same with valuing land." Many blacks fled the South, vowing never to go back. But Washington wants to restore the legacy of those agrarian connections and the culture of agriculture. "When I was in Santa Cruz, it really started to sink in," she recalls. "Looking at the landscape in California, I saw this white-led food movement, and I asked, 'Where are the farmers who look like me? Where are the black farmers? Where are the people of color in the food movement?'" After she finished the apprenticeship and returned to New York, Washington reached out, hosting a first-ever conference of black farmers. Since that initial gathering in Brooklyn in 2010, the Black Farmers and Urban Gardeners Conference has become an annual meeting, taking place this year in Atlanta. "The conference is a place for people of color to connect and to understand that slavery is part of the American experience, but it doesn't define us as a people," says Washington. "The apprenticeship gave me the experience to see the lack of diversity in the farm movement." And like hundreds of others, Washington emerged from the apprenticeship with a vision she put in to action. Back on the campus Farm, Daniel Press says it's tempting to sum up the impact of 50 years with data points about organic farming or sustainable agriculture, but the campus's greatest impact has always been its people. Today, as ever, the Center produces leaders. "Fifty years ago, I don't imagine the students who transformed that hillside into a lush garden thought of themselves as visionaries, but they were," he says. "We carry on their legacy today, working toward an environmentally sound, socially just food system. And there isn't a prettier, tastier, better way to do this than the way we are doing it at UC Santa Cruz." Inspired to be an apprentice? Applications accepted through September 30, 2017.